With a rich natural and cultural history, fascinating geologic formations, two of the country’s clearest and most beautiful spring-fed rivers, and outdoor recreation galore, the Ozark National Scenic Riverways is an incredible resource loved by generations of Missourians. ". . the time has also come to identify and preserve free-flowing stretches of our great rivers before growth and development make the beauty of the unspoiled waterway a memory." With these words, President Lyndon Johnson designated the Ozark National Scenic Riverways as the country’s first federally protected riverway in 1964. Made up of over 80,000 acres along the spring-fed Current and Jacks Fork Rivers, the park welcomes hundreds of thousands of visitors every year drawn by its scenic beauty, recreational opportunities, and diverse natural and human history. For over 150 years, the area was home to many families who farmed the valleys and tamed small areas of a vast wilderness. Missouri’s southeastern Ozarks were long isolated from outside influence due to the rugged landscape and lack of improved transportation routes. Scotch-Irish settlers began to filter in shortly after The Louisiana Purchase in 1804. Steady settlement occurred in the area following the addition of Missouri as a state in 1821. By the 1850s, most lands in the river valleys were occupied by subsistence farmers. The Civil War brought devastation to the region and economic recovery was slow to come. Not until the 1880s did major change begin with the coming of railroads and lumber companies. The lumber companies established large mills producing millions of board feet of native pine lumber, while the railroads provided economical transportation for people and products in and out of the region. The timber boom brought an economic boom to the local economy and many pioneering families took part in this new industry. However, excessive logging stripped the countryside bare. What the loggers didn’t take, wildfire did. Rains washed topsoil into the rivers and gorged them with gravel. The region grew poorer and only sheer determination kept the Ozark people on their farmsteads eking out a meager living. Amid this environmental ruin, a new conservation ethic was born amongst local residents alongside businessmen from Kansas City, St. Louis, Springfield, and beyond. As early as the 1870s, the region became known for its scenery and abundant wildlife. With the railroads came urban sportsmen eager to hunt and fish the area. In time, they grew concerned with preserving the area’s abundant natural resources, and in 1919 the Missouri State Fish and Game Commission was established. Visits by respected conservationists Aldo Leopold and Leonard Hall drew attention to the area while the newly popular automobile brought better roads and more tourists. With growing interest in the region, in 1924 Missouri established state parks at Round Spring, Alley Spring, and Big Spring. But the beginning of the Great Depression in 1929 brought it all to a halt until President Franklin D. Roosevelt’s New Deal ushered in the Civilian Conservation Corps. CCC camps were established to promote conservation and recreation throughout the country, including the three state parks along the Current and Jacks Fork Rivers. The 1930s saw the purchase of large tracts of land for designation as the Clark (now Mark Twain) National Forest. In 1936, the Missouri Department of Conservation was established to better enforce fish and game laws. And the U.S. Army Corps of Engineers began studies on the damming of the Current River for hydroelectric power. Once again, international events put a stop to those plans as the U.S. government turned its focus to winning World War II. After the war, plans to dam the river resurfaced but an anti-dam conservation movement in the 1950s squelched any plans to harness the free-flowing Current. In 1956, the National Park Service called for the establishment of a corridor park along the Current and Jacks Fork Rivers. Four years later Congress appropriated funds for a feasibility study on the establishment of an "Ozark Rivers National Monument". Concerned about the loss of historic family farmland and tax revenue, local residents and officials offered stiff resistance. But in 1962, President John F. Kennedy endorsed the formation of Ozark National Scenic Riverways, and in 1964 President Lyndon Johnson signed it into law. The formal dedication ceremony was held at Big Spring in 1972, presided by Patricia Nixon Cox. From drive-up and plug-in campgrounds to hike or paddle-in primitive sites, the Ozark National Scenic Riverways has hundreds of campsites perfect for getting away from it all. To prevent the spread of pests that are harmful to local forests, do not bring in firewood. Firewood can be purchased locally. With clear, spring water and peaceful Ozark scenery, the Current and Jacks Fork Rivers are among Missouri’s favorite floating destinations. Bring your own canoe, kayak, or raft or rent from one of several outfitters in the area. Learn traditional skills, crafts and lifeways at living history demonstrations. Tap your toes to authentic bluegrass. 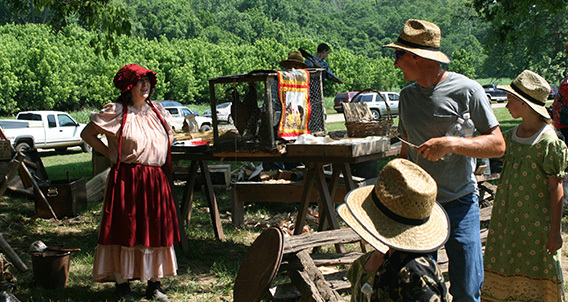 Every summer, the park hosts a number of events celebrating Ozark history and culture. And don’t miss weekly ranger programs on everything from Civil War history to stargazing. Fish for trout, goggle eye and smallmouth bass in the spring-fed waters of the Current and Jacks Fork Rivers. Scout the hills and hollows for deer, turkey, and small game. The park has always been a sportsman’s favorite. Be sure to follow all state regulations. Discover the human history of the Ozarks at several sites, including the photogenic Alley Mill, Klepzig Mill, Welch Hospital, and historic Civilian Conservation Corps district at Big Spring. Protecting some 80,000 acres of river, forest, field, and glade environments, the park is home to some of the largest fresh-water springs in the world and over 300 caves. Explore Round Spring Cave on a ranger-led tour. Experience the beauty of the Ozarks on two—or four—feet. The park offers miles of marked trails for hiking and horseback riding. With trailhead staging areas available, you can bring your own horse or visit one of the stables that operate near the park. Observant nature lovers can spot an abundance of wildlife, birds, and wildflowers throughout the park, including the rare Swainson’s warbler, wild turkey, whitetail deer, several turtle and skink species, bald eagles, and the unique Ozark hellbender. With so much to explore, the park is a great place to earn your Junior Ranger badge. 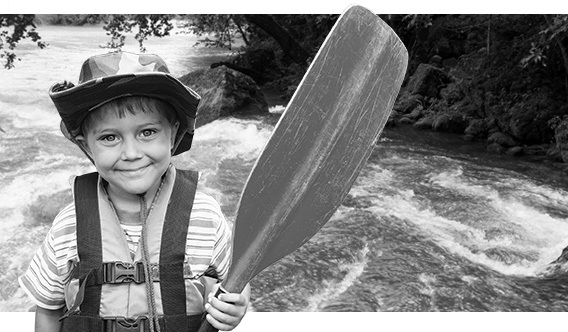 Borrow a River Exploration or Birdwatching Kit to investigate the nature around you. And don’t miss the Ranger-led campfire programs, cave tours, and demonstrations.